The court granted defendant's motion to amend its pleadings to include a claim for inequitable conduct during reexamination. "[Defendant] alleges specific [plaintiff] representatives . 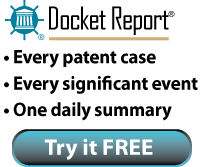 . . each failed on several occasions to inform the PTO that the interpretation of the asserted claims of the [patent-in-suit] [plaintiff] urged the PTO to adopt had been rejected by this Court. . . . Regardless of whether a patentee in all cases has an obligation to disclose a District Court's adoption of an unobjected-to recommended claim construction, or whether a patentee has an obligation to explain the impact of a Court's claim construction on arguments the patentee has made to the examiner, under the facts alleged here it is plausible to believe that [plaintiff] intentionally decided not to make these disclosures because [plaintiff] intended to deceive the examiner into believing she was applying the Court's claim construction, when [plaintiff] knew she was not, and when [plaintiff] feared application of the Court's claim construction could lead the examiner to invalidate its claims." The court sua sponte dismissed plaintiff's infringement action with prejudice after post-trial discovery showed that during trial plaintiff's counsel affirmatively misrepresented to the Court the statements of key on-sale bar witnesses regarding important evidence disclosed only during trial. "Defendants have produced testimonial evidence clearly and directly contrary to the representations [plaintiff] made to the Court during trial. That [plaintiff] may have backpedaled from these statements over time, after trial had finished, does not relieve it of its responsibility for its misrepresentations to the Court at what all present recognized was an absolutely critical point in the trial. . . . The testimony reveals that this is not a simple case of innocent mischaracterization. [A witness] said one thing, and counsel told the Court that he said something else. Such willfulness compels a finding of bad faith. If the actual statements made by [two witnesses] at this critical inflection point had been reported to the Court, the Defendants’ trial strategy would have been entirely different. More significantly, the Court would, in all probability, have entered judgment for the Defendants forthwith. . . . Just as with witnesses testifying truthfully under oath, the proper administration of justice depends upon counsel being completely forthright with the Court. . . . [N]ot every lawyer who lies to a court will be caught, so when such deliberate and advantage-seeking untruthful conduct is uncovered, the penalty must be severe enough to act as a deterrent. Awarding attorney’s fees – even if they were to be paid by [plaintiff's] counsel alone – is insufficient. Such serious misrepresentations cannot be excused as simply the cost of doing business. Attorney’s fees also may be appropriate, but such an affront to this Court, to the other parties, and to judicial integrity can only be answered with dismissal." The court denied plaintiff's motion in limine to preclude the testimony of defendant's damages expert that a running royalty may be capped. "Georgia-Pacific factor #11 is '[t]he extent to which the infringer used the invention and any evidence probative of the value of that use.' Accordingly, [defendant] is free to argue, based on actual use of the patented method (i.e., the 'book of wisdom'), that a running royalty would not exceed a certain amount. But this is only one of several relevant factors in the reasonable royalty inquiry; [plaintiff] will have the opportunity to attack this opinion at trial and to emphasize other factors."